Yeah, it’s as bad as it looks. A long time ago (I mean, like, 10 years ago or something), I got inspired and created this binder for all the recipes I was tearing out of magazines. This was way before Pinterest and iPads and all those good digital ways to organize recipes now. I got lots of magazines in the mail and I tore out a ton of recipes for the binder. 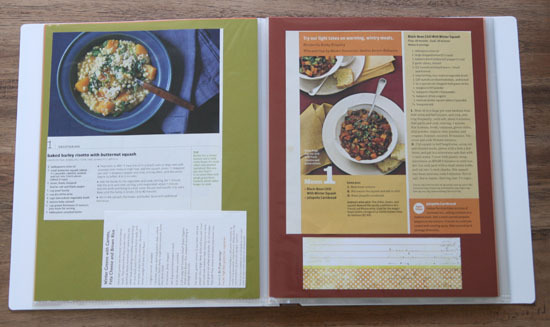 The problem was, after the initial organizing, I kept ripping but I never really placed the recipes in the binder. I’d shove them into the front cover, and the pile grew and grew and grew, becoming this daunting task I never wanted to tackle. And I never looked at it, really, because to find a recipe meant to sift through that massive pile of papers. Enough is enough, I recently decided, and overhauled the system. Want to see how I did it, and how I achieved recipe enlightenment? Here’s what you’ll need to create a sleek, organized, useful recipe keeper. 1. Sort, organize and PURGE. I went through that massive pile and threw out about 70% of the recipes. They were either kind of duplicates, or something I was no longer interested in, or so old that our eating style had changed. While I was sorting and eliminating, I was putting recipes into piles for categories like desserts, mains, side dishes, drinks, appetizers, etc. Now, pile by pile, I trimmed each recipe with a paper trimmer. Sometimes, a recipe was just a small corner of a page; other times, there were so many other distracting recipes and things on the page it took me a while to remember which recipe I wanted. 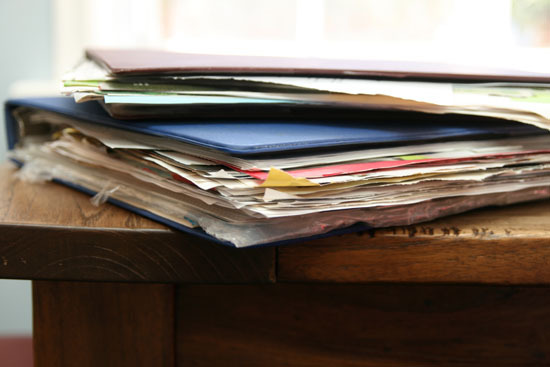 Now you’ve got a pile of lovely, trimmed recipes. 3. Organize and begin pasting. Decide how you want to sub-organize your categories, if that’s applicable. 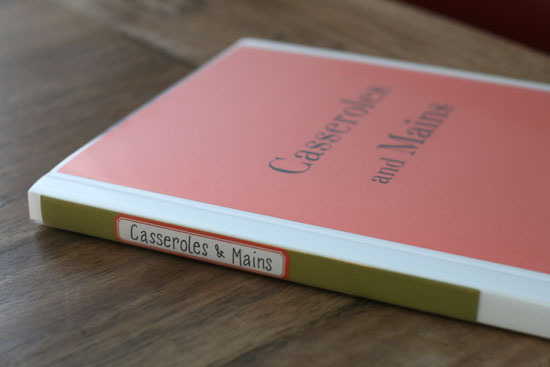 For me, in mains I had a bunch of casseroles, stews, pasta dishes like lasagna, etc. I gathered them together so that I could keep similar dishes near each other. 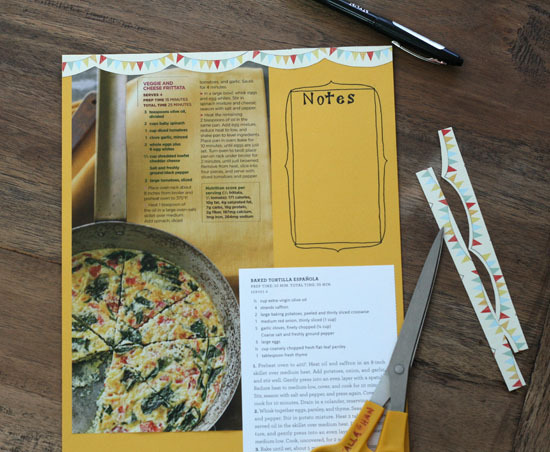 Take a piece of cardstock and lay out one or more recipes on it. Glue it down with the glue stick. 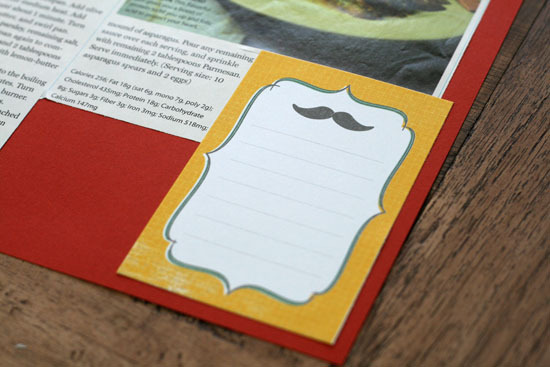 In order to save paper, I then turned the cardstock over and glued the next recipes to the back. 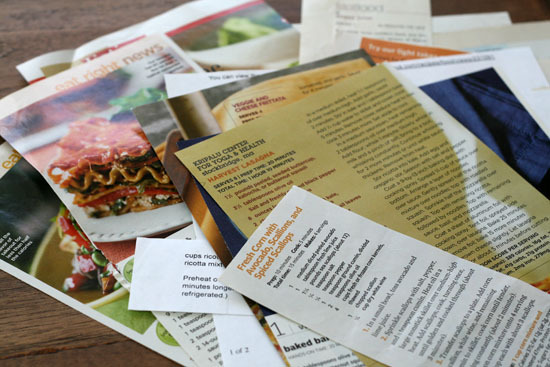 If you want to be able to reorganize and move recipes around, you might want to only use the fronts of the paper. I like to write notes on recipes, especially since I tweak them relatively often. Only have the chili powder, add mushrooms to this sauce, it needed to cook an extra 15 minutes, whatever, it’s nice to have space to write these ideas. I added some note areas, sometimes with embellishments I pasted in and sometimes by drawing a section for it. Here where you can be as decorative or as utilitarian as you please. If you just want to get it done, paste and leave it! If you want it to be lovely (make one as a gift? ), prettify to your heart’s desire. 5. Slide your papers into the page protectors inside the presentation binder. 6. Make a label for the side and the front cover. I made this label to slip down into the spine of the binder so I can change it up later. That’s it! Now you have a lovely book that’s easily contained, and recipes are organized. Make one for each category, or divide one into several categories with adhesive page tabs. Decide on a recipe limit. I had so many recipes, I was never going to have enough time to cook them all. By using these presentation binders, you give yourself a finite limit on the number of pages you can add. That keeps everything under control, for the most part. Once the binder is full, you’ll have to ditch a recipe for every new one you add, which keeps a constant but manageable reassessment going. Consider using removable adhesive. 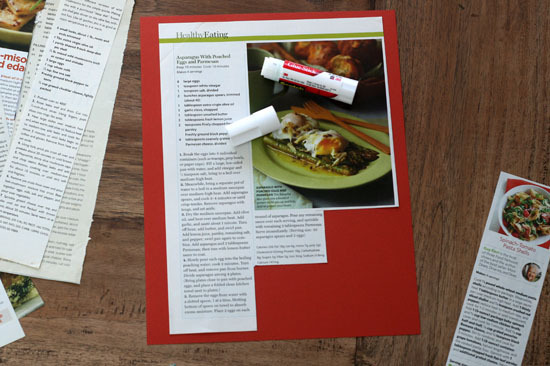 If you have a lot of recipes that you haven’t made, you might consider using a removable adhesive so that you can pull off any recipes that just don’t work. I went full monty with the regular glue stick, but if you want to be able to ditch something easily you could use something like this Restickable Glue Stick . 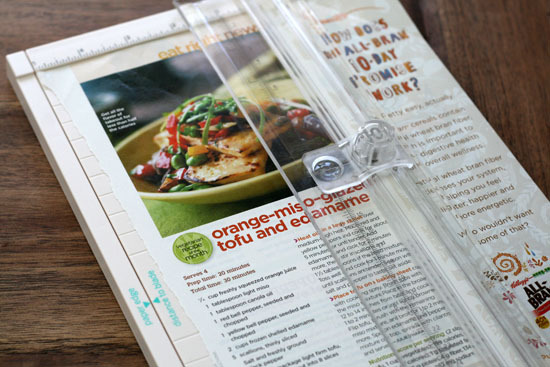 How do you organize recipes you pull out of magazines? Have you gone full digital? Or are you still keeping a paper set of recipes? I have a bunch of loose recipes, too (weird, because I’ve never really ben much of a cook), and this is a nice idea to corral them. Thanks! Thanks, Haydee! I’ll have to check out Tastebook… I’ve never used it before. Thank you for this practical way to manage all of my magazine clippings and online recipe printouts. 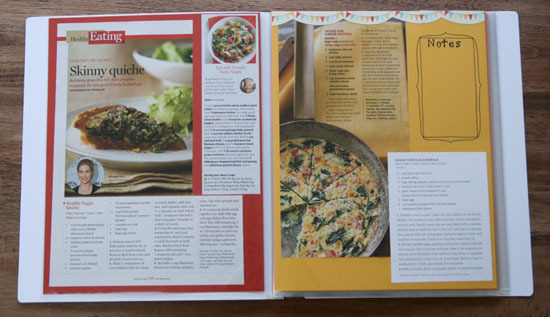 I have a strange addiction to those little recipe magazines you find at the checkout counter. They are taking over my bookshelves. Since I only use about 1/4 to 1/3 of the recipes in each one, I can tear out the ones I want to keep, organize them, and throw away the rest . That paper cutter is now on my shopping list. Great ideas!